I get sick of trends quickly. I know it depends on the person, like anything, but I feel most people like to ride a fad out until it starts dying quicker than when it appeared. The whole folk/Americana thing going on right now seems to be played out, and it's unfortunate considering how great the genre is as a whole. Having said that, I have to add to this by saying that not all hope is lost. because, every so often, an act comes along that sways me back onto a positive opinion of it. 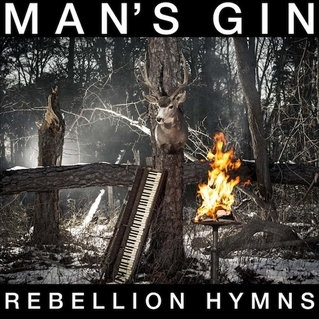 Man's Gin, Rebellion Hymns, is one of them. The first thing I thought of when listening to this album was how much I wanted to grab a bottle of whiskey and sit by a fire while enjoying the tunes, which, I'm sure, is something Man's Gin does daily. As a whole, the album takes on a very rustic tone, which fits in perfectly within the genre itself. But the good thing is it doesn't entirely define the sound as a whole, which is something I find most bands that sound like them do today. "Never Do The Neon Lights", probably my favorite track on the album, plays out more like a country song, displaying a twangy vibe better reserved for commercial radio. That sounds like a insult, but rest assured it's never in the aesthetics of music that I find fault, it's in the overall delivery, and Man's Gin does it so well you forget your preconceived notions of country (If you have any like I do). "Deer Head & The Rain" also sounds very commercial, but in the most low-fi way possible. It's rare I hear bongos being played in an album anymore (Of any genre), but the song uses them so well you feel more like you're watching friends jam out instead of listening to an album, which totally broadens its appeal to me. Making a song intimate, while not being played live, is one of the hardest things you can do in music. "Off The Coast Of Sicily" is a welcome addition to the record in that it is more rock oriented than folk. Considering the album was released by Profound Lore Records (Who seem to release some pretty great metal records), this song may have been the selling point to having it be released. It's dark, but powerful, which makes it sound more akin to English gothic metal band (Cradle Of Filth, anyone?) than the Americana I mentioned earlier. "Cellar Doors" and "Sirens" continue the bands strong showing on this album, swatting away any doubt I had that there was going to be just a few amazing tracks instead of a whole albums worth of songs. It maybe the pathetic excuse of a job I have that makes me yearn for anything decent in this god forsaken world, but this album delivered in a way I did not expect. It's a welcome addition to life to have a band deliver such a unique and tightly produced piece of work.